I have a major update and some minor updates for Threadstr. It’s still not meaningfully functional, but it’s far enough along that I don’t intend to wipe the database on updates anymore. All functions in the Options page are now usable. (Or, at least, they’re supposed to be.) Additionally, there’s a favicon added, helmet is being used to secure the Express app, and forever-monitor is being used to reset the server when it goes down for whatever reason. Finally, I moved the MySQL command that simply keeps the database alive to another place because it’s possible that its previous location was causing a memory leak by opening up way too many connections and not closing them, and its frequency is now every ten minutes instead of every five seconds. Next up is actually being able to create and add to threads– The Feature Presentation. Working(ish) model of Threadstr now online. 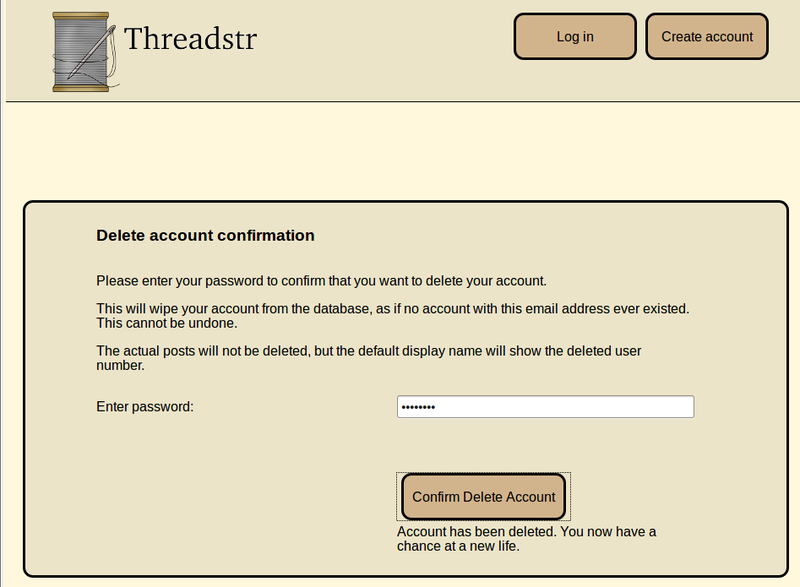 I bought the domain name threadstr.com a while ago (before I bought this one, actually). The project isn’t anywhere near completion, but, since DO droplets are a mere $5 a month, I decided to go ahead and put up what I have so far– Partly as having it out there publically will be incentive to get myself working on it some more, but mostly just to show what I have so far. “Incomplete” is an understatement. At this point, the only thing that a user can do is create an account, but, nonetheless, a lot of work has gone into what’s there so far. Unfortunately, “a lot of work” doesn’t mean the website is usable, so more work is going to be required to make it functional. Development on this project is slow-moving since it’s an at-home project (and it’s also my first exposure to Node.js). Slow-moving, but not at a standstill. I’m going to take a quick break from it to work on a timekeeping program that I discussed with my sister. I was telling her about how useful scripting languages can be and, among other things, how I’ve been using a VBScript program to keep track of how long I spend on each project (it would be PowerShell if I wrote it today). She’s expressed interest, and I plan to make it into a full-fledged program to add to my portfolio. I thought about making it a C++ Qt program, but decided that, in the interest of time, I should go with something that I know, so it’ll be a Java program instead. That will, of course, be showing up on this site and GitHub eventually. 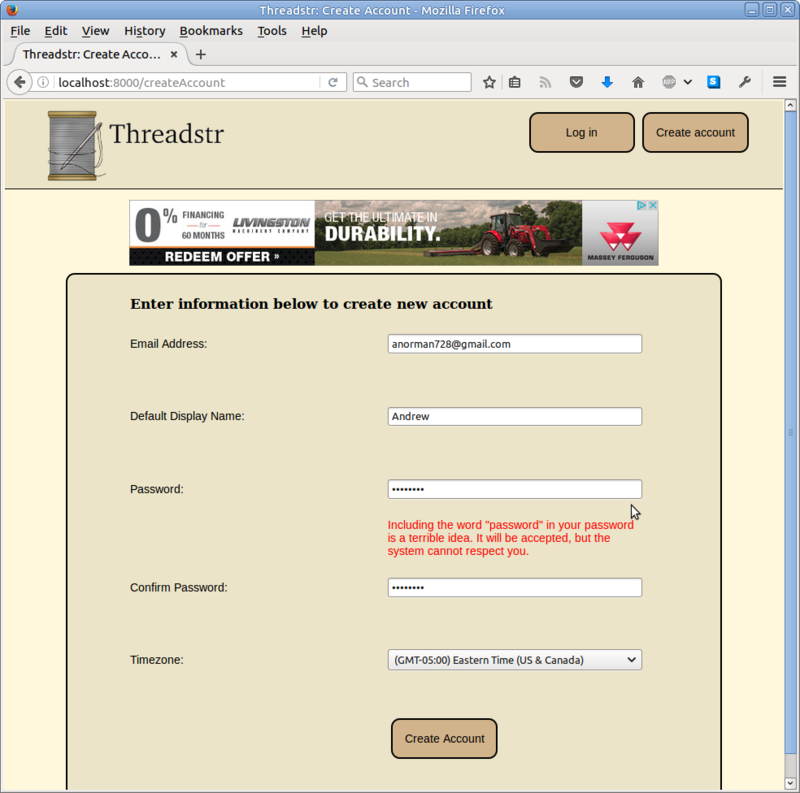 Threadstr: My current big project. 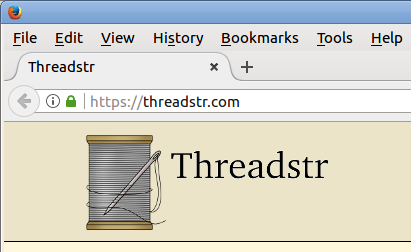 I’ve decided to go ahead and open source my current big project (at home, at least): Threadstr. Soon, I’ll also set up a Droplet to host the incomplete project just to show it at work, although it’s not yet functional (or even close to functional). The basic idea is to create a discussion thread that’s not actually attached to a particular message board. This might seem unusual at first, but the idea is that it can be shared and organized in a way that’s better than Facebook comments or Twitter replies. As for the code, I’ll let my in-code documentation speak for itself. A future plan is to allow the user to create debate threads, which would let two people have a moderated text debate, where the moderator is the server. It would determine when you can post (opening statement, rebuttal, cross-x, and closing statement), a minimum and maximum post length, and a time window that would determine when someone is allowed to post. I’ll put up a working (but incomplete) model in the near future– Possibly tomorrow. I would do it tonight, but it’s getting too late to do much more work. Oh, and a shout-out to my friend and coworker Cari Landrum for the logo. My version looked awful, so I took it to her and she made this version that looks fantastic. UPDATE: I think I’m going to wait just a little while before putting up a working model. Right now, the only thing you can do is create an account, which will be wiped out eventually anyway.